BASE jumping is one of the world’s most dangerous sports. That’s hardly surprising really, considering the aim of BASE jumping is to leap from a standing object such as a bridge, tower, building or cliff with only a parachute. 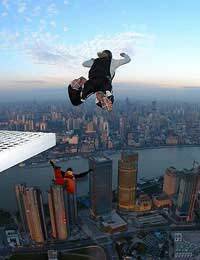 There were at least 140 fatalities related to BASE jumping between 1981 and December 2009 and in 2002 it was estimated there was one fatality for every 60 BASE jumping participants. The acronym BASE stands for building, antennae (such as an aerial mast), span (a bridge or arch) and earth (cliffs, mountains or canyons). This forms a complete list of the fixed objects BASE jumpers plummet from, having a short period of free fall before opening a parachute and gliding to the ground. BASE jumping has been described as bungee jumping without a bungee cord, but is more like skydiving without an aeroplane. Before becoming a BASE jumper, you must complete a full course of skydiver training. BASE jumpers need to master many of the same techniques that skydivers use to maintain stability and altitude awareness while in the air. Try to make at least 200 skydives in order to become comfortable with parachutes, free fall and split-second decisions. Only experienced skydivers can contemplate a BASE jump, as it is such an unpredictable activity that requires an astute awareness of altitude and outstanding free fall technique. Once you are an accomplished skydiver, find an experienced member of the BASE jumping community to act as your mentor. Find someone you get on with, who is a good teacher and has done more than 200 BASE jumps because you will, in effect, be putting your life in their hands. Before making your first BASE jump, it really is worth the money to get qualified, professional instruction. Many BASE jumpers skip this step because of the cost involved, but that is not advisable. You will learn a lot more if your first jump course is not taught by the same mentor who guides you through your next 20 to 50 jumps. Most BASE jumping injuries and deaths are caused by failure to maintain a clear area around the jumper during the descent or when landing. It might be that the wind is against them, or the jumper may make a mistake when launching the jump causing them to collide with the object they have jumped off. The nature of the sport dictates that there are rarely designated areas for BASE jumpers and the makeshift landing targets are often not big enough for a safe jump. As a result, BASE jumpers can be seriously, perhaps fatally, injured because they have not been able to steer themselves to the landing area. No two BASE jumps are the same, so it is very difficult for a jumper to predict what will happen once he starts plummeting towards the ground. This means that to survive a BASE jump you need a level head, the ability to react to surprises without panicking and lightning quick reflexes that will allow you to make instantaneous adjustments in your position or trajectory. Even then, no amount of skill and experience can guarantee that you will complete a jump without mishap, so even the most accomplished jumpers take serious risks every time they throw themselves off of a building, bridge or cliff.